"Insanity, then, is inordinate or irregular, or impaired action of the mind, of the instincts, sentiments, intellectual, or perceptive powers, depending upon and produced by an organic change in the brain." In that same year, Dr. Amariah Brigham, one of the founders of American psychiatry, also wrote that insanity "is now considered a physical disorder, a disease of the brain." It would be 150 years, however, before these statements could be proven. Since the early 1980s, with the availability of brain imaging techniques and other developments in neuroscience, the evidence has become overwhelming that schizophrenia and manic-depressive disorder are disorders of the brain. Additional research done during the past decade has revealed that schizophrenia is caused by a combination of genetic or biological predisposition as well as other factors such as prepregnancy factors, pregnancy stress, other prenatal factors, social stress, family stress or environmental stressors during a person's life. Research has now shown that children's and teen's brains are very sensitive to stress (up to 5 to 10 times more sensitive than adult brains) and can be damaged by frequent or ongoing stress. To learn more about the causes of schizophrenia, and how to prevent it - read these two documents: Causes of Schizophrenia, Prevention of Schizophrenia. A brief summary of some of the evidence that proves this point follows. 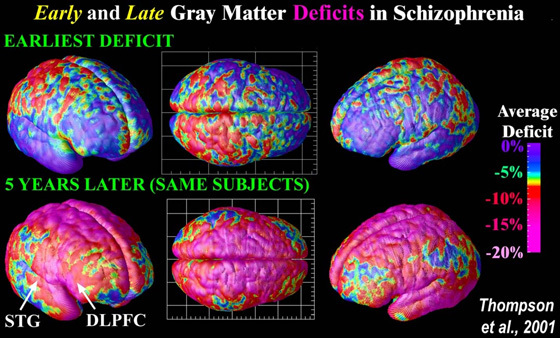 Significant Loss of Brain Gray Matter: Individuals with schizophrenia, including those who have never been treated, have a reduced volume of gray matter in the brain, especially in the temporal and frontal lobes. Recently neuroscientists have detected gray matter loss of up to 25% (in some areas). The damage started in the parietal, or outer, regions of the brain but spread to the rest of the brain over a five year period. Patients with the worst brain tissue loss also had the worst symptoms, which included hallucinations, delusions, bizarre and psychotic thoughts, hearing voices, and depression. Please note that while there is significant loss of brain gray matter, this is not a reason to lose all hope. In recent (September, 2004) group of presentations and discussion we had with Dr. Daniel Weinberger and other leading National Institute of Mental Health (NIMH) schizophrenia researchers, we learned that there are reasons to believe that this gray matter loss may be reversable. Moreover, the NIMH is currently researching a drug that seems to have potential for reversing the cognitive decline that is caused by schizophrenia, and there are many drug companies also now researching in this area. It is anticipated that we will see some significant announcements related to these develpments in the next few years. To see more images of brains that are suffering from schizophrenia, go to: Schizophrenia Brain Images. 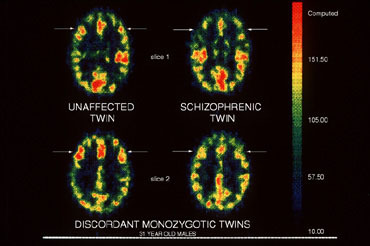 The Image Source is: Laboratory of Neuro Imaging, UCLA, Derived from high-resolution magnetic resonance images (MRI scans), the above images were created after repeatedly scanning 12 schizophrenia subjects over five years, and comparing them with matched 12 healthy controls, scanned at the same ages and intervals. 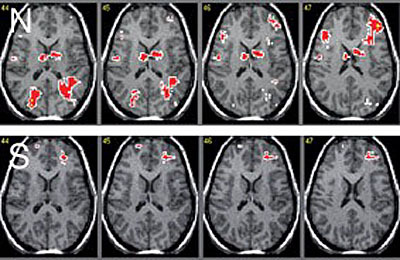 Severe loss of gray matter is indicated by red and pink colors, while stable regions are in blue. STG denotes the superior temporal gyrus, and DLPFC denotes the dorsolateral prefrontal cortex. Note: This study was of Childhood onset schizophrenia which occurs in 1 of every 40,000 people and is frequently a significantly more aggressive form of schizophrenia (than later onset schizophrenia which afflicts approximately 1 of every 100 people). Lawrie SM, Abukmeil SS: Brain abnormality in schizophrenia: a systematic and quantitative review of volumetric magnetic resonance imaging studies. British Journal of Psychiatry 172:110120, 1998. Enlaged Ventricles in the Brain: Individuals with schizophrenia, including those who have never been treated, typically have enlarged ventricles in the brain, as demonstrated in over 100 studies to date. Ventricular enlargement in schizophrenia related to volume reduction of the thalamus, striatum, and superior temporal cortex, Am J Psychiatry. 2004 Jan;161(1):154-6. Progressive structural brain abnormalities and their relationship to clinical outcome: a longitudinal magnetic resonance imaging study early in schizophrenia. Arch Gen Psychiatry. 2003 Jun;60(6):585-94. Cerebral ventricular enlargement as a generalized feature of schizophrenia: a distribution analysis on 502 subjects., Schizophr Res. 2000 Jul 7;44(1):25-34. Van Horn JD, McManus IC. Ventricular enlargement in schizophrenia. A meta-analysis of studies of the ventricle:brain ratio (VBR). British Journal of Psychiatry 160:687697, 1992. Soares JC, Mann JJ. The anatomy of mood disorders: review of structural neuroimaging studies. Biological Psychiatry 41:86106, 1997. Elkis H, Friedman L, Wise A, et al. Meta-analyses of studies of ventricular enlargement and cortical sulcal prominence in mood disorders. Comparisons with controls or patients with schizophrenia. Archives of General Psychiatry 52:735746, 1995. Enlarged Amygdala: Individuals with manic-depressive disorder have an enlarged amygdala and increased numbers of white matter hyperintensities. Strakowski SM, DelBello MP, Sax KW, et al. Brain magnetic resonance imaging of structural abnormalities in bipolar disorder. Archives of General Psychiatry 56:254260, 1999. Dupont RM, Jernigan TL, Heindel W, et al. Magnetic resonance imaging and mood disorders: localization of white matter and other subcortical abnormalities. Archives of General Psychiatry 52:747755, 1995. Videbech P. MRI findings in patients with affective disorder: a meta-analysis. Acta Psychiatrica Scandinavica 96:157168, 1997. Neurological Abnormalities: Individuals with schizophrenia and manic-depressive disorder, including those who have never been treated, have more neurological abnormalities, as shown in over 25 studies. Structural and functional abnormalities of the amygdala in schizophrenia. Schroder J, et al. Neurological soft signs in schizophrenia. Schizophrenia Research 6:2530, 1992. Torrey EF, et al. Schizophrenia and Manic-Depressive Disorder. New York: Basic Books, 1994, pp. 127 ff. and pp. 176177. Impaired Cognitive Function: Individuals with schizophrenia and manic-depressive disorder, including those who have never been treated, have more neuropsychological abnormalities that impair their cognitive function, including such things as information processing and verbal memory. Neuropsychological deficits in children associated with increased familial risk for schizophrenia, : Schizophr Res. 2004 Apr 1;67(2-3):123-30. Long-term memory deficits in schizophrenia: primary or secondary dysfunction? Neuropsychology. 2003 Oct;17(4):539-47. Convergence of biological and psychological perspectives on cognitive coordination in schizophrenia, Behav Brain Sci. 2003 Feb;26(1):65-82; discussion 82-137. A prospective study of childhood neurocognitive functioning in schizophrenic patients and their siblings, Am J Psychiatry. 2003 Nov;160(11):2060-2. Goldberg TE, Gold JM. Neurocognitive functioning in patients with schizophrenia: an overview. In: Psychopharmacology: The Fourth Generation of Progress, Bloom FE and Kupfer DJ (eds). New York: Raven Press, 1995, pp. 12451257. Hoff AL, Shukla S, Aronson T, et al. Failure to differentiate bipolar disorder from schizophrenia on measures of neuropsychological function. 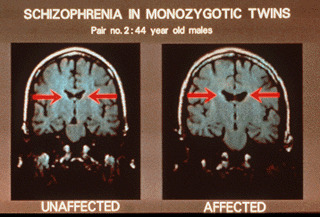 Schizophrenia Research 3:253260, 1990. Morice R. Cognitive inflexibility and pre-frontal dysfunction in schizophrenia and mania. British Journal of Psychiatry 157:5054, 1990. Decreased Prefrontal Brain Function: Individuals with schizophrenia, including those who have never been treated, show decreased function of the prefrontal area, an area of the brain that we use for planning and thinking about ourselves. 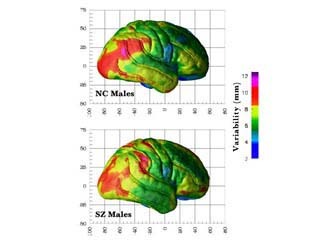 Above: Decreased brain activity in schizophrenia subjects (S) compared to normal controls(N) in an fMRI study examining executive functioning. Image courtesy of Prof. Philip Ward, NISAD Cognitive Neuroscience Research Panel. Decreased expression of mineralocorticoid receptor mRNA in the prefrontal cortex in schizophrenia and bipolar disorder. Berman KF, Weinberger DR. Functional localization in the brain in schizophrenia. In: Review of Psychiatry, vol. 10, Tasman A and Goldfinger S (eds). Washington DC: American Psychiatric Press, 1991, pp. 2459. Andreasen NC, et al. Hypofrontality in neuroleptic-naive patients and in patients with chronic schizophrenia. Archives of General Psychiatry 49:943958, 1992. Impaired Awareness of Ilness: Approximately 50 percent of individuals with schizophrenia and manic-depressive disorder, including those who have never been treated, have impaired awareness of their own illness. This has been shown in at least 50 different studies. Such individuals do not realize that they are sick, and they will, therefore, usually not accept treatment voluntarily. Studies suggest that this impaired awareness is probably related to the decreased function of the prefrontal area of the brain. These individuals are thus similar to some patients who have had a stroke and, because of brain damage, are unaware of their disability and deny it. The lack of awareness of illness in individuals with schizophrenia and manic-depressive disorder is the most common reason that they do not take their medication. [as can be seen in the research below, the part of the brain that is resonsible for self-analysis seems to be one of the areas most damaged by schizophrenia; the brain that is damaged, cannot frequently recognize that it is damaged]. This is a problem is because increasingly schizophrenia research is suggesting that the sooner a person with this brain disease is treated, the better the outcome for the person. Delays for treatment result in much worse outcome (see recent research below). Patterns of neurocognitive deficits and unawareness of illness in schizophrenia. Specific frontal lobe subregions correlated with unawareness of illness in schizophrenia: a preliminary study, J Neuropsychiatry Clin Neurosci. 2001 Spring;13(2):255-7. Does insight affect long-term impatient treatment outcome in chronic schizophrenia? Amador XF, David AS. Insight and Psychosis. New York: Oxford, 1998. Ghaemi SN. Insight and psychiatric disorders: a review of the literature, with a focus on its clinical relevance for bipolar disorder. Psychiatric Annals 27:782790, 1997. Peralta V, Cuesta MJ. Lack of insight in mood disorders. Journal of Affective Disorders 49:5558, 1998. Does treatment delay in first-episode psychosis really matter? The impact of the duration of untreated psychosis prior to first psychiatric admission on the 15-year outcome in schizophrenia. text copyright: The Treatment Advocacy Center; 3300 N. Fairfax Drive; Suite 220; Arlington, VA 22201.